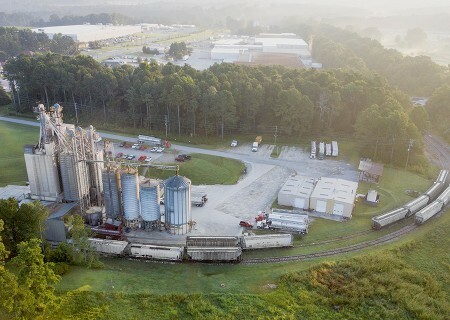 Jamaica Broilers Group (JBG) has acquired a feed mill in Georgia for an undisclosed sum as part of its expansion thrust in the US. 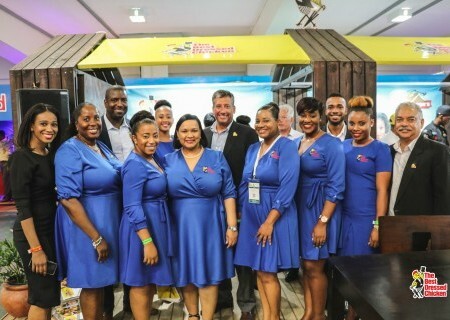 In an advisory to the Jamaica Stock Exchange, JBG said it is finalizing the asset purchase agreement with Crystal Farm Mills through its subsidiary Wincorp Properties, but has already taken over the day-to-day operations of the facility. 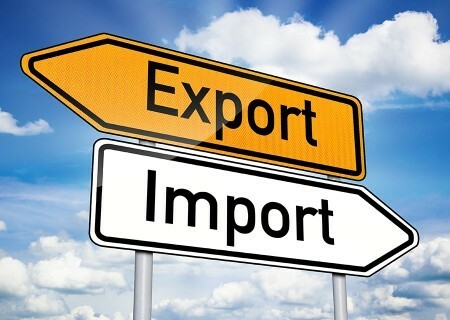 Efforts by some American chicken producers to establish a stronghold in the local market is not going down well with several Jamaicans. 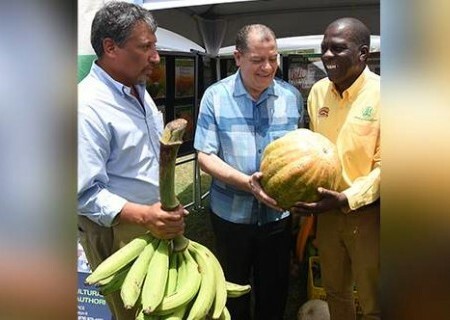 JAMAICA - Industry, Commerce, Agriculture and Fisheries Minister Audley Shaw says the ministry is targeting the implementation of several strategies intended to boost Jamaica’s livestock and dairy industries and enable the country to become more self-sufficient in these areas. 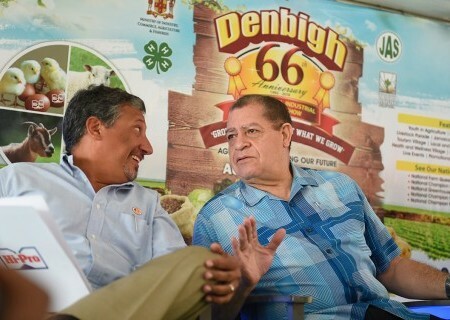 President and Chief Executive Officer of the Jamaica Broilers Group Christopher Levy stressed his company’s commitment to the annual staging of Denbigh and the development of the agriculture sector. 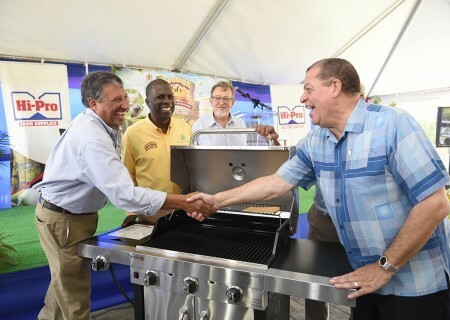 Agriculture Minister, Audley Shaw (right), is surprised with a birthday gift of a barbecue grill from the Jamaica Broilers Group. 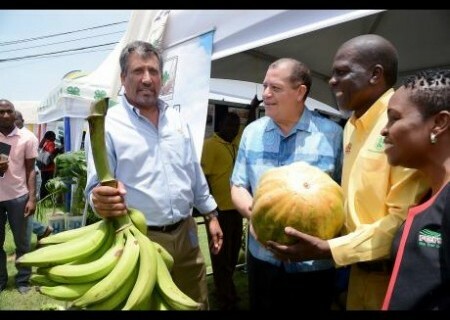 Pictured (l-R) are Christopher Levy, President and CEO of Jamaica Broilers Group; Norman Grant, JAS President; Conley Salmon, President, Jamaican Operations, Jamaica Broilers Group; and Robert Levy, Chairman of Jamaica Broilers Group. 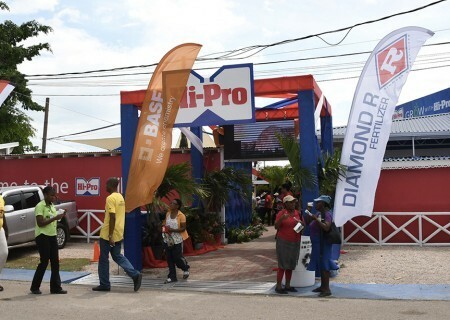 The presentation was made on Friday at the launch of Denbigh 2018 on the lawn of Hi-Pro, White Marl, St Catherine. 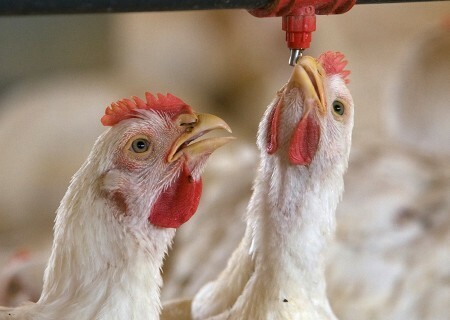 The Jamaica Broilers Group — Jamaica’s largest poultry producer — has come out in support of the shift in focus by the Minister of Industry, Commerce, Agriculture and Fisheries, Audley Shaw’s towards “moving from macro-economic stabilisation, to micro-economic mobilisation”. 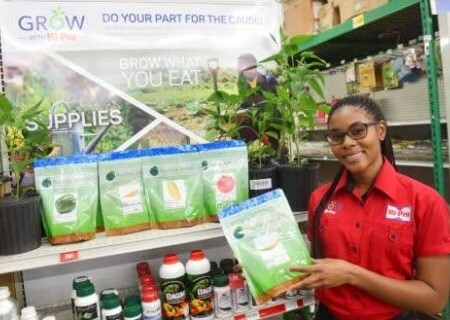 In keeping with its commitment to bring cutting edge products to the local market, the Hi-Pro Division of the Jamaica Broilers Group has introduced the Diamond R Purkote Control Release Fertilizer in various blends. 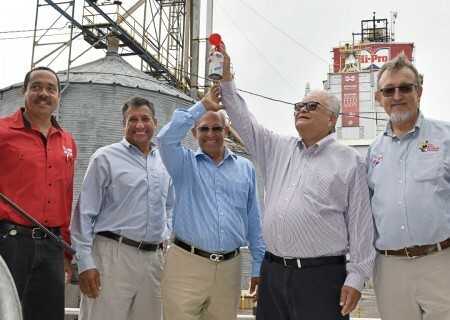 Jamaica Broilers Group (JBG) officially commissioned into operation a third pellet mill at its Old Harbour, St Catherine Best Dressed Feed Mill last Thursday. Minister of Industry, Commerce, Agriculture and Fisheries, Hon. 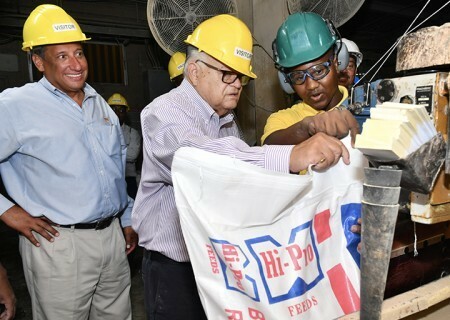 Karl Samuda, has hailed the Jamaica Broilers Group for its US$2 million investment in a new pellet mill, which will significantly boost the company’s feed production capacity.